The ID Tech Xpress 100 has been discontinued. No direct replacement is available. 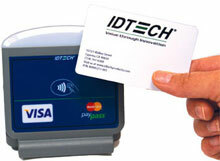 With the IDTech Xpress 100Customers hold their card or key fob near the reader landing plane to complete a purchase transaction. It supports financial association requirements for contactless payments. The unique design allows for counter top use with stand. Xpress reader has four LED's and beeper to signal successful completion of the transaction.